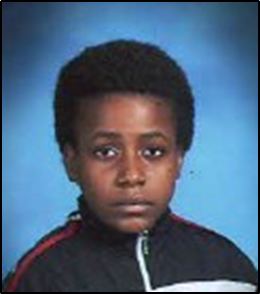 The Boston Police Department is seeking the public's help in our efforts to locate Claude Benjamin Nherisoon JR, a 15-year- old black male described as having short black hair, 5’4” tall, and 120 lbs. He was last seen wearing a black hooded sweatshirt, blue pants and black sneakers. Claude also has a hunched over left shoulder and suffers from anxiety. He has not spoken to anyone since October 2013. If you see Claude Benjamin Nherisoon JR, please call 9-1-1 or District D-4 (South End)) Detectives at 617 343-5619.